Windows Phone is not totally dead yet, Microsoft has not officially created a tombstone for it, plus there are a couple of smartphones running Windows Phone that are available in new condition from various sellers in the market. One such phone is the Alcatel 4S Idol, available as fully unlocked, for $199 with free shipping at the official Microsoft Store. This is a GSM phone, so you can use it on those carriers, not Sprint or Verizon. 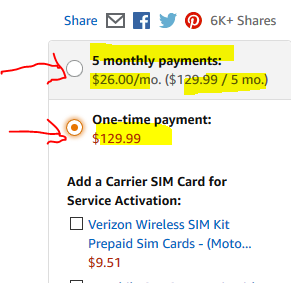 On the other half, if you want to stay under $150, and you are not tempted by the Moto G5 Plus offer, fear not, Amazon has a budget deal for you too IF you are a Prime member and you do NOT object to the “Lockscreen Ads” version of the Motorola Moto G (4th Generation) in the 2GB RAM with 32GB on-board storage denomination. This very model is currently on sale, probably for a limited time only, for $130 with free shipping at amazon.com. Limit one per customer since this is a pretty, pretty, pretty good price (as the returning in October Larry David likes to say). The offer is only good on the black color scheme. The standard versions without the Amazon Lockscreen Ads go for $200, so the difference is definitely big enough at the moment to put up with the Lockscreen ads. This Moto G4 is also an “all carrier” smartphone, so you can use it with any of the big four in the US market, including the CDMA duo (Verizon, Sprint), along with the more flexible GSM duo (AT&T, T-Mobile). If you don’t like contracts, but do not object to seeing ads and sponsored screensavers on your phone, and if you are a Prime member (or do not object to becoming one), you can get an $80 discount on the brand new Alcatel Idol 5S, unlocked and without contractual obligations! Prime members can get this in the Prime Lockscreen Edition for $200, versus $280 for the standard version. It is the same phone, except for the ads. It is up to you to decide whether a $80 discount is an acceptable trade-off to seeing ads. Check reviews of previous phones Amazon offered in this fashion to see if this is something you can live with. Certainly $80 is a bigger discount than some of the other phones Amazon offers in this program that range from $30 to $50. Trying to capitalize on the success of the Idol 4S, they pick up a well-received Snapdragon for this model, the 625 Octa-Core, with 3GB RAM, 32GB storage, and a microSD slot that can take up to 512GB cards, which is nice. You get a 5.2-inch 1080p touchscreen, a very fresh Android 7.1 (compared to the fast majority of other Android phones out there). It supports T-Mobile and AT&T out of the box, and per the description over there, support for Sprint and Verizon is coming later in the summer. The Snapdragon 625 is used in other “all carrier” phones like the Motorola Moto G5, so it is certainly capable for supporting Sprint and Verizon. IF you are not a Prime member, but you want to get the discounted version, you’ll have to buy it at full price ($280) but after you become a paid Prime member, in other words after the 30-day free trial ends and you pay for the Prime membership, Amazon will give you an $80 gift card, the difference between the lockscreen and non-lockscreen version. There are some conditions in place to make sure people don’t try to cheat on this, so check the terms/conditions. 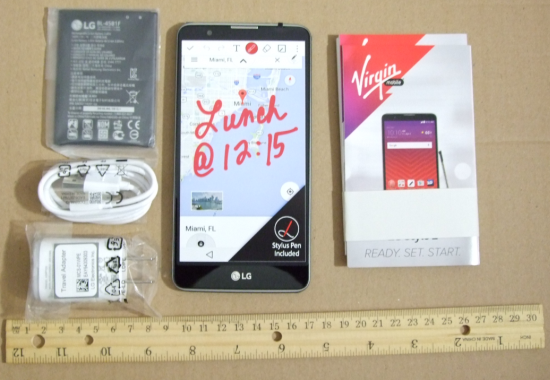 The Virgin Mobile USA official online store has the new condition LG Stylo 2 Android smartphone on sale for $80 with free shipping. You have no contractual obligation, so you can buy it and use it as a Wifi-only device if you want to. However, every time you reboot it will try to activate. You cannot stop that but you can counter it – see our detailed post on this. This comes with Marshmallow out of the box, but a Nougat over-the-air update is already available for it. I have this phone, and I will post a review of it as a Marshmallow phone, and once I do that, I will upgrade it to Nougat. One thing that makes me delay the Nougat update is that Nougat blocks the various Task Managers apps, so it makes it harder to monitor and kill misbehaving apps (if you like to do this sort of thing). This is particularly relevant for this device because LG is almost TouchWiz level of having all kinds of apps you can’t turn off or uninstall. If you are looking for a Wifi-only smartphone with a basic built-in stylus, this is a pretty, pretty, pretty good deal for $50 with free shipping! It is the LG Stylo 2 for Boost Mobile sold for a limited time at this price by Best Buy on eBay. Limit one per customer. Free store pickup is also an option where possible. I have the Virgin Mobile USA version of this. I haven’t finished writing the review yet, but at $50, this is a slam dunk buy. So far I posted the Unboxing (text and pictures only; no annoying video), along with a walk-through how to deal with activation pestering. This is a no-contract phone, but it is locked to the carrier it comes from. If you want to get your Samsung Galaxy Note smartphone fix while waiting to see what the follow-up to the ill-fated Note 7 (which may have been the best smartphone of all time – ironically), the used market is one way to go. Among the latest eBay Deals, you can get the Samsung Galaxy Note 4 in seller-refurbished condition for $150 with free shipping by QualityCellz on eBay (99.4%, ships from Southern California). This is model N910, with 32GB on-board storage, microSD slot, and unlocked 4G LTE. No contract – you own the phone upfront! NOTE if you are planning to use this with a cellphone plan (not as a Wifi-only device), make sure you check the bands are compatible with your carrier(s) of choice. If not certain, check the various Android/smartphone forums, or use your favorite search engine. The S-Pen is included per the ebay listing. Some claim the Note 4 was the first in the Note series to “get it right” but of course that’s always subject to debate. It came out in 2014, with a Snapdragon 805, and 3GB of RAM which is nice (assume 1GB is eaten up by “TouchWiz”). This is a great bang for the buck phone, whether you need one for Virgin Mobile or want to use it as a Wifi-only device, or having it grab internet from a hotspot or another connected phone. 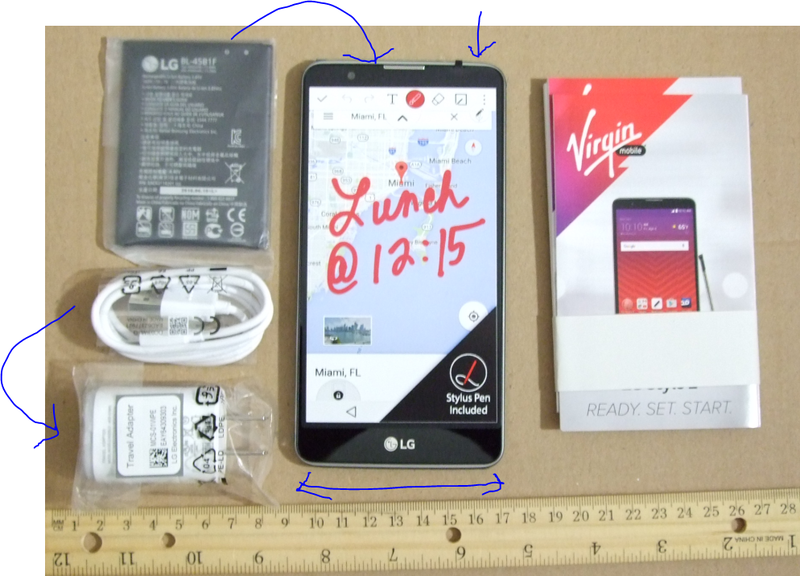 It is the new condition LG Stylo 2 for Virgin Mobile, on sale for $80 with free shipping, with a limit of up to three units per customer, at Amazon by Amazon actual. This comes with a Stylus that is included/stored in the phone’s body. It also has a removable battery and takes microSD cards. It has 2GB RAM of which is almost a must for today’s Android phones. It comes with Marshmallow out of the box. If you like smartphones with a stylus but don’t want to pay the Galaxy Note big bucks, there’s a double-figures alternative. The new condition LG Stylo 2 in the Boost Mobile edition (under of the Sprint umbrella) is currently on sale for $86 with free shipping at Amazon by Amazon actual with a limit of three per customer. There is no contract requirement, but these are locked to the specific prepaid carriers. You can of course always use them as Wifi-only devices. This has a built-in pen, and you get some special features that are linked to the pen, but note that this is not as good as the Samsung S-Pen, which is factored in the price 🙂 But for the price and given the 5.7″ screen size, this is not a bad value under triple figures. I purchases this a couple of weeks ago and will be reviewing it. I’ve already posted the first part, how to deal with the Activation Menus of the Stylo 2. The one in review is the Virgin Mobile version, but given the links between the two, things should be similar. If you like phones with a built-in stylus but don’t want to pay the Samsung flagship bucks for the Note line, there is a prepaid phone by LG available at a couple of Sprint’s cousins going for $100. It is the LG Stylo 2, a second generation model, going for $100 with free shipping at Amazon in the Virgin Mobile and the Boost Mobile. NOTE: when reading reviews and price-checking around, make sure you are looking at the second generation model. The first generation model was under-powered and plagued by performance issues. The “2” has more reasonable specs and comes with Marshmallow out of the box. It has a 5.7-inch, 2GB RAM, Snapdragon 410, 16GB on-board plus microSD, etc. 2GB RAM is a good minimum to shoot for as apps, just like the web, get bloated as time goes by. The first generation LG G Stylo was a bit of a disappointment, so LG upped the specs and the OS version with the second generation, aptly named “LG Stylo 2” (hey, at least they got the name right!). As the name suggests, its claim to fame from a bushel full of entry to mid range phones is the built-in stylus. It has more usable specs than the first generation, with 2GB RAM, Snapdragon 410, and Android 6.0 out of the box. It has a 5.7-inch IPS 720p display, along with 16GB on-board storage and microSD slot. This is however locked to Boost Mobile, so if you are planning to use it as an actual phone, you are stuck with them. Later on you may be able to use it on other Sprint-affiliated networks, but don’t count on it. On the other hand if you are planning to use it as a Wifi-only device, eg as a general purpose “household remote” and “bedtime phone” type of a device, then you don’t need to worry about the cellular aspects. All that brings us to the sale, it is currently going for $100 with free shipping, in new condition, by ShopCells, with the order fulfilled by Amazon (so it is Prime eligible) or from the same seller but through eBay (over 370 units sold so far). If you want to get the latest flagship Nexus phone but don’t want to pay a flagship price, there is the refurbished option, which is more appealing when it is manufacturer refurbished. Which brings us to the manufacturer refurbished 32GB Nexus 6P (made by Huawe), unlocked without contract requirements, going for $350 with free shipping by Best Buy’s eBay store. This is an online only offer, there is no store pick up option. Limit three units per customer. It is as usual a never-ending cycle, do you buy the latest phone now, or wait for the new Nexus phones in the fall that will likely come out to coincide with the release of Android 7.0 (aka Nougat)? This is where refurbished may be a good option, since we are closer to the future models than we are not. Sony’s new line-up of X-series smartphones has arrived in the US market, and the mainstream option of this line, the “Sony Xperia X” is now available for $550 in four different colors, but that’s not all! Amazon.com is bundling this with a 128GB Sony-brnaded microSDXC memory card for the same price of $550. This is pretty good since the phone can take microSD cards up to 200MB! This particular combination is in-stock and shipping as of the time of writing. This is their flagship deputy (or sidekick, choose your own analogy here), with a 5-inch 1080p display, 3GB RAM, 32GB on-board storage plus the aforementioned microSD slot. It is running Android 6.0, and is powered by the Snapdragon 650 and Adreno 510 combination. Its camera has a decent size sensor for a smartphone, a 1/2-inch Exmor RS. The big decision for Sony fans may be between this and the X Performance flagship. Many of the specs are similar between the two, but the X Performance has the Snapdragon 820 and Adreno 530 combination and a slightly larger battery, along with IP68 water resistance certification (one of the early signature characteristics of Sony flagships). This goes for $700 and does not come with a free memory card. It is expected to ship in mid July. The product pages mentioned above have a detailed list of compatible GSM providers as this is a factory unlocked phone with a USA warranty. The USA market has the usual suspects, AT&T, T-Magenta (okay, T-Mobile), their prepaid sidekicks (Cricket, MetroPCS), Straight Talk, Net10, H20 Wireless, and more.